All apologies, I’ve fallen very behind on my reviews this year… though it’ s not due to a dearth of worthy releases! 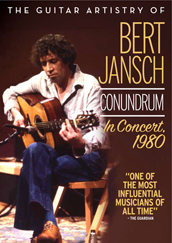 Since it’s been a little while since I’ve gushed about the legendary Bert Jansch, I thought I would talk about his latest release, In Concert, 1980, out now on SGGW. From what I understand, this show had already made the rounds on the VHS circuit (thanks Yair!) but this new issue, part of Stefan Grossman’s Guitar Artistry series, features bonus footage from a second concert, as well as a short documentary entitled A Man and His Songs. The material and performances on offer here nicely bridge the gap between Jansch’s classic solo period of the mid ’60s and the sober, welcome renaissance of recent years… and for that I consider it a document of utmost importance… but In Concert is also a rare glimpse of Jansch at his collaborative best, playing both new compositions and compelling arrangements of old favorites, with players who not only have the chops to keep up with the unpredictable Scottish guitar hero, but also carry a genuine affection for the man and his art. The Bert Jansch Conundrum was a loose sort of group that Jansch formed in the late 70’s, presumably to add a little muscle to his sound and recreate the vibe of some of his albums from that decade. Auxiliary musicians in those years included Rod Clements, Mike Piggott, and the two men who join Jansch for this concert, mandocellist Martin Jenkins (who left his unmistakable stamp on 1979’s fascinating Avocet) and demure electric bassist Nigol Portman-Smith. This trio is a relatively tight one, and most of the tunes follow a similar presentation : Bert singing lead and chording, while Jenkins keeps the melody flowing on violin or mandocello and sings backup. Portman-Smith’s understated yet bouncy bass does a great job of holding down the low end, and these men do keep quite a solid rhythm, despite the lack of any percussion. Though the actual amplified sound of Bert’s acoustic is somewhat tinny, his relentless attack, combined with the comparatively warm and natural sound of the other instruments makes for an intriguing blend, particularly on an instrumental track like “Bittern”, which finds Jenkins trilling away on his phaser-assisted mendocello, adding some sonic interest to this series of bluesy vamps. Portman-Smith is a tone-monster on this tune (nothing beats the thump of a well-played electric bass through a ’70s Acoustic rig) and has a very fine solo. Another highlight from this set is “Ask Your Daddy”, a poignant child/parent sketch in the tradition of Jansch’s own “Tell Me What Is True Love”. “Daybreak” finds Bert painting a picture of his formative years in the basement folk clubs, as he sings about the surreal feeling of coming out into the Sunday morning sunlight after an all-nighter. A few of the tunes don’t quite take off. Jansch seems to give up on the solo traditional “Blackwaterside” early, mumbling many of the words. “Running From Home”, from Jansch’s seminal first album, is sung here by Jansch and Jenkins as a round… and though it’s an interesting approach, it doesn’t match the emotional weight of the original. Similar can be said for the cover of Jackson C. Frank’s signature “Blues Run The Game”, which rarely benefits from any adornment whatsoever. The set ends pretty strong… Jenkin’s gets the crowd clapping along for his dextrous solo “Medley of Jigs & Reels”, which leads into the moody 7/8 jazz-blues of “Nightfall”. Bert seems to be in danger of falling asleep while introducing “Sovay”, but the trio turn in a respectable performance of this tricky tune. “Alimony” closes the set, a spirited blues that, once again, is set apart by the trio’s unique sonic blend of instruments. Unfortunately, Jansch’s guitar playing is somewhat overpowered by the phased mandocello, and the song mostly belongs to Jenkins. A 1978 performance of “Come Back Baby”, from this DVD’s bonus section, has Jansch and Jenkins finding a better balance, or at the very least, a more astute sound man. A Man and His Songs, the bonus documentary that dates from 1985, is a strange little film. The camera work is questionable, particularly during the clips from a concert in Edinburgh, where the wandering cameraman seems to be a serious distraction to Jansch during his performance of “Blackwaterside”. Bert seems a bit more comfortable during the interview segments, which give a few insights into the guitarist’s feelings on performance and his day to day life, and more comfortable still down at the pub playing darts with friends. The rehearsal footage is good fun, particularly the rambling “Candyman”, and we get to see Bert just a couple months into breaking in a new trio. All in all, it’s easy to see that it isn’t in Jansch’s nature to revel in the spotlight, and the whole documentary has a kind of awkward energy around it… but for serious fans, A Man and His Songs will help to complete the picture of what Bert Jansch was up to in the mid ’80s. This entry was posted in Reviews and tagged 1980, A Man and His Songs, Acoustic, Bert Jansch, Fingerstyle, Folk, In Concert, Jackson C. Frank, Martin Jenkins, SGGW, Stefan Grossman on June 1, 2011 by Work & Worry.